A panoramic canvas is wide, beautiful, and stunning when displayed on the walls of your home. It has the ability to transform a space with a vibrant injection of color, and is perfect for staircases and landings. We can make them really large - even up to 3m in length - so if you have shot your own panorama or are thinking of doing so, this could be the ideal canvas printing option. The finish to the sides and corners of the canvas means that the frame will not crack, tear, or split – even after many years of use. We use woven canvas and the image is fused into the fibers of the canvas textile; we're so confident in our work that we give a lifetime guarantee. Our photo canvas art prints are all made in our factory, with high quality canvas printing and build quality, few can match us on delivery, print and service. Excellent! So happy with my gorgeous print! We can print your panorama on a wide variety of canvas sizes, so you can customize the dimensions to the space on the wall that you have in mind. Panoramic canvas prints really do enhance the look and feel of a room, and work equally as well in bedrooms as in living rooms! The modern touch provided by this technique gives a home a very elegant atmosphere; just imagine walking home and being confronted with a fabulous panoramic canvas print on the wall! It is so easy to upload your photo and design online, and our preview system is detailed and comprehensive. There is something truly remarkable about having your very own images printed onto canvas, but this reaches an unbelievable level with a panoramic canvas. As the name suggests, the wide view provided by one of these prints could be a sensational way to transform a home, and it is becoming increasingly popular as a unique interior idea. Each one is personalized with your creative ideas, and our preview system will allow you to tweak certain aspects at your leisure. Perhaps the best photos printed onto panoramic canvas are those that feature horizons or stunning landscapes, like some of the ones shown in the gallery above. But if you have a great idea for a panorama that falls outside of these options, feel free to have a go at shooting one and then have it printed onto canvas. If you have a photo that is not panoramic at the moment, but features a gorgeous horizon, you might like to crop it into a wide rectangular shape that would be perfect for this technique of printing. Large canvas prints are fantastic for offices that up until now have consisted of blank, dull walls that could do with a dash of color. We print your design directly onto the canvas using a deep penetration technique, which infuses eco-friendly inks deep into the fibers creating a long lasting print. The canvas frames are handmade, and then the printed canvas is hand stretched over the frame to ensure the best finish every time. Everything is bespoke and made to order, ensuring only the highest quality every time. 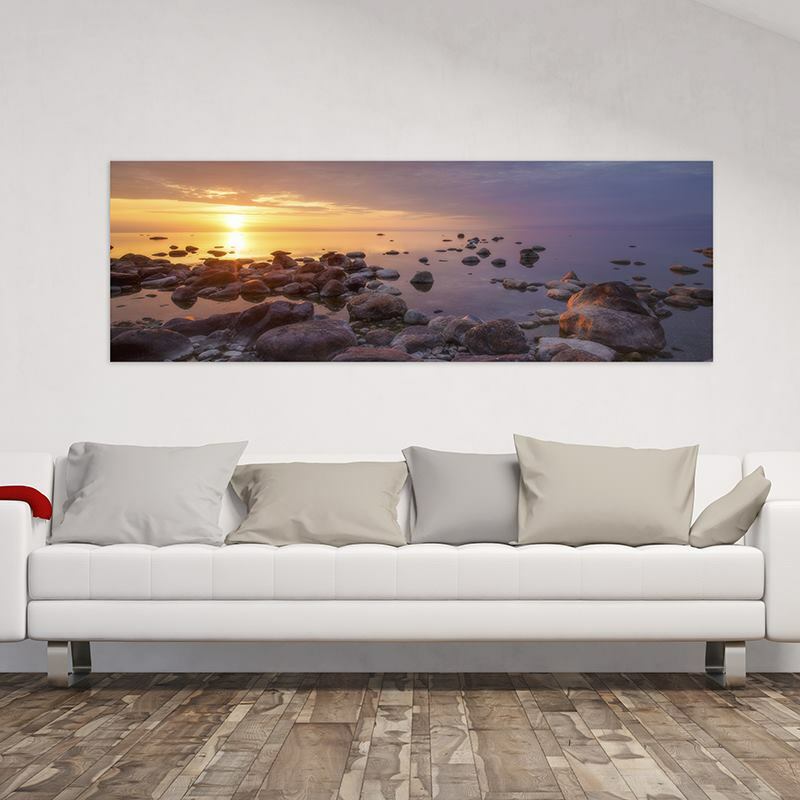 Perhaps the best photos printed onto panoramic canvas are those that feature horizons or stunning landscapes, like some of the ones shown in the gallery above. But if you have a great idea for a panorama that falls outside of these options, feel free to have a go at shooting one and then have it printed onto canvas. You can even upload photography or art directly from your iPhone. If you have a photo that is not panoramic at the moment but features a gorgeous horizon, you might like to crop it into a wide rectangular shape that would be perfect for this technique of printing. Large canvas prints are fantastic for offices that up until now have consisted of blank, dull walls that could do with a dash of color.